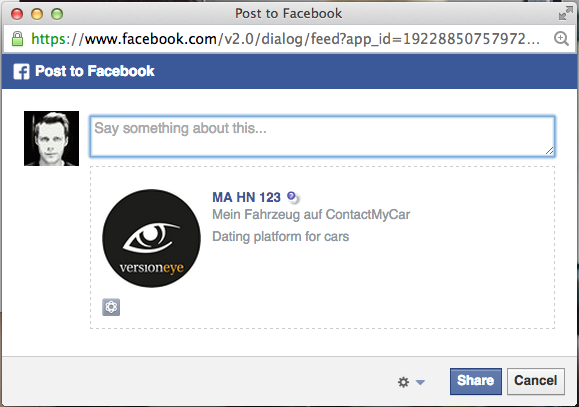 Let’s say you have an awesome social network, a dating platform for cars, and you want to share your cars profile on Facebook. It should look like this. How do you do that? And finally you need a link/button to trigger the JS function. I used a link. How to get notified about out-dated dependencies in build.sbt? just installing FB comtenms on (funnily enough) my Scottish music websites and came across this page when trying to sort out the permalink code bit (can’t imagine why Facebook doesn’t explain that properly). The info above sorted things out pretty fast, so thanks!